Several years ago my husband and I took a trip from our home in Southeastern Michigan to Manistee, a beautiful little town along the shores of Lake Michigan. If you are looking for a great Lake Michigan beach town as the perfect setting for your next family vacation, this website is for you. Continue reading "Lake Michigan Beach Towns"
Would you like to share your knowledge about lake michigan beach towns? Great, find out how you can submit your story or tip here. Continue reading "Contribute to Lake Michigan Beach Towns"
Continue reading "Northern Michigan Rentals"
Continue reading "Grand Haven Rental"
Continue reading "South Haven Rental"
Our family has found a new favorite restaurant to add to the many we go to at our favorite Lake Michigan Beach Towns!!! On a recent trip to Holland, our friends took us to Boatwerks Waterfront Restaurant at 216 VanRaalte Ave. We had heard this was a great place to eat and watch the sunset and I must say we were not disappointed. We sat outside since it was excellent weather and we wanted to get the best view of natures sunset show. So to make a long story short, we had great service, excellent food, a great sunset, and a perfect time. Boatwerks is not even on Lake Michigan (it is on Lake Macatawa which leads to the big lake) but it is a perfect resort area restaurant. I would recommend your family try it as well. There is even a park next to the restaurant that also sits on Lake Macatawa. This provided a playground to keep the kids busy, while the adults stretched out the evening (like we have a wont to do). This restaurant is a great example of a place that you are surprised to find in Michigan unless you know about our beautiful Lake Michigan Beach Towns. Holland (as well as South Haven, Saugatuck, and Grand Haven) are full of a unique combination of resort area activities and restaurants, along with good ole Midwest hospitality. They rival the resorts in California, Florida and the East Coast without some of the attitudes or “tourist tiredness” that can be found in each of these areas. Check out our website soon for pictures of our time at Boatwerks. And check out Boatwerks as well. Let us know what you think. Muskegon’s Summer Celebration is massive. Huge concerts, a midway, parades, children’s activities, parties, fireworks if it is something you would like to see at a festival, they have it and in huge quantities. We like to make it an annual trip and hit at least one concert. This year we are eyeing the Chris Daughtry concert. The concerts are mostly “bring your own chair or blanket” seating which really makes it feel like you are just in the park while a really great group is playing your favorite songs. Much better for kids that way too. And of course you have to stick around for the fireworks show, which is always one of the best I have seen. Muskegon’s Summer Celebration is 11 days long so if you are renting in South Haven, Saugatuck, Holland, or Grand Haven anytime from the end of June through the first week of July then it is a “can’t miss” event. Check out www.summercelebration.com for all the activity listings as well as ticket information and as always check out www.LakeMichiganBeachTowns.com for all your cottage rental or things to do needs while at one of our Lake Michigan Beach Towns. Continue reading "Festival Time on Lake Michigan"
Summer Time equals Festival Time!! It is now officially June (June 1 to be exact). And you know what that means. Well, I guess it means a lot of things, but one of the things I think of is, it is now Festival Season on the Lakeshore!!! Every year June, July and August has at least a festival or two going on in one of our favorite Lake Michigan Beach Towns. Festivals are like icing on the cake. I mean you are already on vacation at Lake Michigan and are enjoying everything that goes with that and you walk downtown and “boom” a festival breaks out. Like they knew you were coming and planned it all for you and your family. At least that is our reaction when we stumble upon a festival happening that we didn’t realize was that weekend. But then there are others (probably the smart ones) that plan their vacation around these festivals, realizing that they make a great vacation, “greater”. For those of you who like to plan, or for those of you who just want to check if you are lucky enough to be in town when a great “summer fest” is going on, we are creating a new page on our website, www.LakeMichiganBeachTowns.com. Check it out under festivals. We will separate them by date and by city (South Haven, Saugatuck, Holland and Grand Haven). And we will include links to get more information regarding each festival. Lake Michigan is warming up! Lake Michigan’s water temperature is starting to warm up!!! Just a week or two ago temps at our Lake Michigan Beach Town beaches were stuck in the 30’s but now all of them are in the high 40’s (Grand Haven, Holland) and low 50’s (Saugatuck, South Haven). I know not exactly swimming temperatures, but the slow climb to 60’s and 70’s has begun. This is just one more sign that summer is not far off. Have you made your Lake Michigan vacation plans yet? We keep in touch with some of our cottage owners and have heard that their cottage calendars are starting to fill up. The stores and restaurants are hiring summer help and stocking the shelves with inventory. Summer hours are starting to be observed and everyone knows that Memorial Day to Labor Day are the real markers for summers start and end, regardless of what the calendars or even the weather says. By the way if you are interested in water temps at our Lake Michigan Beach Towns, just Google “Lake Michigan Water Temperatures”. You will come across more than a dozen sites that can give you almost real time temps that are read from satellites. And also keep in mind that as the water temp goes up. . . the availability for rentals or Bed and Breakfasts in South Haven, Saugatuck, Holland and Grand Haven goes down. It is a ritual that happens every spring. . . The beginning of May is upon us and you can start to hear the first stirrings of activity around our Lake Michigan Beach Towns. Vacation plans and reservations are being secured, festivals are starting up, the lake is trying to warm up and the leaves are popping out on the trees. So of course our family decided this last weekend that we couldn’t wait any longer and we headed out to one of our favorites, Holland, MI. Of course we are one weekend too early for the Tulip festival but we did get to see a lot of the preparation. This is one of Michigan’s and the country’s largest festivals. Recently it was named “Best Smalltown Festival in America” by Readers Digest. The festival runs from May 5th-12th this year and will attract a ton of people all checking out millions of tulips. 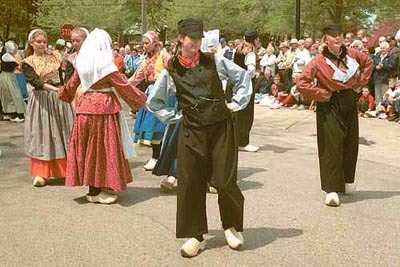 Keep an eye out on our website LakeMichiganBeachTowns.com for a new section on the lakeshores many festivals. Anyway, we had a great weekend. We of course made a trip downtown for both shopping and dinner, then a quick run over to Lake Michigan to see the beautiful blue color the water gets this time of year. We wrapped up the weekend with a shopping jaunt to Holland’s outlet stores and a cookout on a friends deck. It seemed to me there was more activity then I usually remember for the end of April on the Lakeshore. That possibly means that this is going to be a very busy and exciting time for our beach towns this year. If you haven’t found a place to stay yet this summer, check out our many listings on LakeMichiganBeachTowns.com, or if you have a cottage to rent or business to promote make sure to get your information over to us to be listed. Here’s looking forward to a great summer . . .